Arthritis is a very common condition, which affects one in seven South Africans and hundreds of millions of people worldwide. 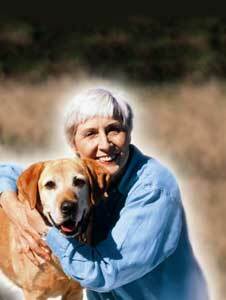 It is also a serious concern for man’s best friend, and is the most common cause of chronic pain in adult dogs. 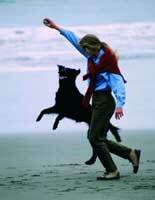 However, when it comes to managing the disease nutritionally our four legged friends are ahead of the pack. Indeed the first food developed using clinically proven nutrigenomics technology was made by scientists to help dogs with arthritis. The pioneering canine arthritis diet contains very high levels of the omega 3 fatty acid EPA (eicosapentaenoic acid) which has been shown to help slow down the progression of this devastating joint disease. The high levels of omega 3 fatty acids also reduce joint inflammation and therefore pain. “The nutrients in the diet literally block the genes that produce cartilage destroying enzymes, and thus protect the joints from further damage,” explains Dr Guy Fyvie, veterinary consultant for Hill’s Pet Nutrition. “We know that the progression from a healthy state to a disease state occurs through changes in gene expression, which can be affected through ingestion of dietary factors. The introduction of pet foods based on these findings is an important step in helping to further explore the concept of nutritional therapy in the treatment of debilitating human and canine diseases,” said Professor John Innes from the University of Liverpool’s Department of Veterinary Clinical Science. Symptoms of arthritis include stiffness and joint pain (which often shows up as difficulty rising from lying down). 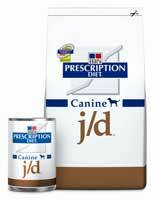 If your dog shows these signs speak to your vet about the new scientific canine joint diet (Hill’s Prescription Diet Canine j/d). People with these symptoms should speak to their doctor.